This is definitely a salt that is big on flavour. It has just the right amount of heat and smokey tones to get most barbecue fanatics excited. The combination of kosher style salt, chilli, garlic and pepper which is then smoked with oak wood adds a real burst of umami flavour and can be added to any dish where you want a greater flavour. We use kosher style salt because it is better at carrying these strong flavours than regular sea salt. Smoked Kosher Salt is definitely a salt that is big on flavour. It has just the right amount of heat and smokey tones to get most barbecue fanatics excited. 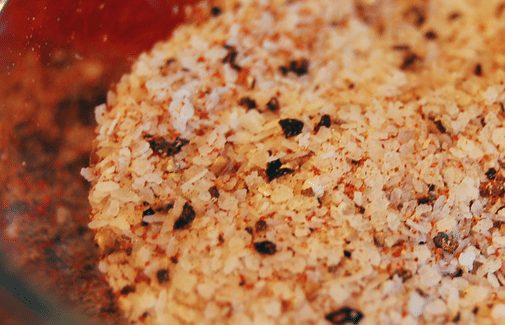 The combination of kosher style salt, chilli, garlic and pepper which is then smoked with oak wood adds a real burst of umami flavour and can be added to any dish where you want a greater flavour. We use kosher style salt because it is better at carrying these strong flavours than regular sea salt. Smoked kosher salt has many health benefits due to its mineral content. It is source of sodium and calcium. It regulates muscle contractions, aids digestion and helps to control blood pressure.